The main objective of Progeca is the satisfaction of its Customers. 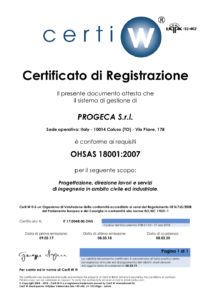 For this reason, even to meet the growing demand from the market, more and more oriented towards established quality standards, has decided to implement an Integrated Management System in compliance with UNI EN ISO 9001: 2015, UNI EN ISO 14001: 2015, OHSAS 18001: 2007. The Directorate of Progeca srl its committed to a policy that places the customer, both internal and external, at the center of the attention. In particular, the internal customer satisfaction is pursued through verification moments, meetings, satisfaction of needs, implementation of suggestions, compliance with the expectations of stakeholders, compliance with the obligations relating to safety and the environment. The external customer satisfaction is pursued by offering and adapting all processes to its particular needs, implicit and explicit, and detected by monitoring both the cultural progress and the achievement of the objectives agreed in the contract stage. The customer takes a central role in the success of Progeca, therefore becomes important to know him, making products and services that meet their needs and create high customer satisfaction. ✓ Ensure the protection of the rights, health and safety of workers. The achievement of the objectives will be monitored through a continuous survey of customer satisfaction, analysis of complaints-output not-conforming near misses, the analysis of the risks and opportunities for the Company, the feedback of the stakeholders and through training and information for staff at all levels.